In the endless search an old soul must endure to find any bit of harbor from the encumbering effect of the modern world, the enveloping warmth of a classic country song can feel like the arms of a dear lover. As if walking straight out of a portal from the early 70’s Kristina Murray seems almost more like Emmylou Harris than Emmylou Harris, except with a style and grace all her own. Her eyes seem to carry the weight of 1,000 sorrows, as do the words to her songs, delivered with a sweet melancholy that arises an empathetic response in the heart, and a consoling effect on the soul. You might have seen Kristina Murray sharing the stage with J.P. Harris as a harmony singer, or appearing on his recent side project Why Don’t We Duet in the Road. Unlike most modern frontmen, the true gentlemen of the genre like J.P Harris and Sam Outlaw don’t relegate their star harmony singers to the back of the stage. And when that woman goes on to bigger things on the strength of her own name, it makes the man look even better. See: Gram Parsons. 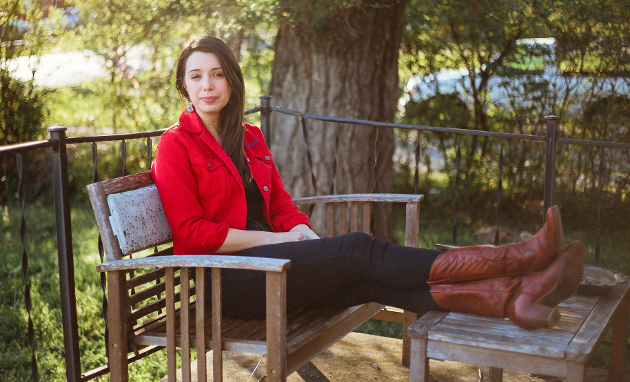 After growing up in Georgia and spending some time in the interior West, Kristina Murray has become one of east Nashville’s best kept secrets, making occasional appearances around town, including the local American Legion’s Honky Tonk Tuesday Nights, which has quickly become a Nashville traditional country institution. But she’s now gearing up for a more active role in music, to hopefully leave behind the grind of food service side jobs and false starts for a deserved full-time career sharing her voice and music with ears hungry for authentic tones. Her first salvo is the song “How Tall The Glass.” Not just a drinking song, Murray makes sure to embed the heartache that goes behind the efforts to drown one’s sorrow in amber liquid via smart lines, while ample steel guitar and supple tones help to chase it down. Kristina Murray is certainly one to be thankful for in 2017, and to look out for in 2018. She had me at three bars. Outstanding. Terrific voice but frustratingly buried by a poor production, unfortunately . ( The cross stick on the snare is just plain annoyingly loud ) . I’m certain this must be a demo ……… I hear crosstalk and noise at the end so I’ll look forward to a more supportive , polished production on her other stuff . Very unique vocal character , though , and certainly lends itself to a trad approach to arrangements . Nice. This song – How Tall the Glass – reminds me a little (her voice) of early Sara Evans – 1997 Three Chords and the Truth. There is an album on Google Play called Unravelin’ by a female artist with the name Kristina Murray (released 2013). Sounds like the same Kristina Murray. (Un-)popular opinion: i don’t like her voice. (After listening to the Unravelin’ album). A more mainstream artist for 2018: Faren Rachels (“If It Ain’t Fixed”). An EP was released 11/10. The label is River House Artists (Luke Combs is a labelmate). Here’s another one to be thankful for being out there and trying to make it in what they love. Check Micahlan Boney out if you see her name near you. wow ….what a great singer …natural gifts …. Wow! Finally a song I can listen to all the way through and actually hear the singer, although I do agree the sticks knocking were annoying. Really good. Appreciate heads up. Kind of a Cowboy Junkie sound. hot damn, that’s some real country music right there. gonna have to check out more of her stuff. Jesus….we have some moaning buggers on here. That’s about the most country song I have heard in the past while. She’s got a great voice, I can hear every word she says. She looks good. There’s a great steel sound and yet some folk moan about the production. Get a grip. Enjoy the music. We don’t hear very much this good. I’ve seen her live a few times in Nashville , once with JP Harris and once with another Nashville guy, Brandon Leigh I think that’s his name. Anyhow, in both performances it was her and a male singer doing classic George and Tammy, Loretta and Conway type duets. Really good stuff. wondered if and when she would be pitching her own music. She seems a little timid, not a real firecracker type of performer. Perhaps as her confidence grows so will the live performances. Shes definitely a known entity in the underground Nashville scene. Could listen to this all day. I like her! Listened to some of her other songs too. Thanks for the introduction to her music. I can see what you mean about Emmylou, she seems to be a natural and makes it sound easy, but something about her voice reminds me of Holly Dunn too. Great sound. Her face looked familiar. Pretty sure she was in the video for Luke Bell’s “Sometimes”. Big fan! Unravelin’ is still one of my favorite country albums of all time. I can’t wait to hear her new one when released. She’s the real deal and about as good as it gets. Thumbs up for introducing her to some new ears.